Comsearch plans radio access networks (RAN) to meet or exceed coverage and capacity objectives. As demand for mobile broadband continues to grow, wireless networks have evolved toward network densification using more cell sites while maximizing efficient use of spectrum. As the pre-eminent global provider of spectrum management and wireless engineering services, Comsearch possesses the expertise required to provide cost effective solutions to these many new challenges. Comsearch has a unique combination of engineering staff, tools, and regulatory expertise to effectively design your radio access network (RAN). Our four decades of experience with RF design, field testing, and model tuning along with expert knowledge of signal propagation theory will help you achieve your goals. Visit search ring areas and identify potential site candidates for macrocells, microcells, or picocells. Prioritize site candidates to meet desired engineering and cost objectives while avoiding any regulatory hurdles. Full Site Acquisition services available to take your project from initial site identification through final construction. Our services include lease negotiation, document preparation, zoning filings, and permitting. Perform RF coverage simulation to determine gaps throughout the service area and identify new search rings. Recommend appropriate RF propagation model based on frequency band, local terrain, and clutter. Ensure a quality user experience by planning sufficient traffic capacity in areas of congestion. Identify specific areas where new sites should be added based on network statistics and predicted demand. As new sites are added for coverage and capacity, perform frequency or physical cell ID (PCI) planning to mitigate intra-system interference in the uplink or downlink bands. 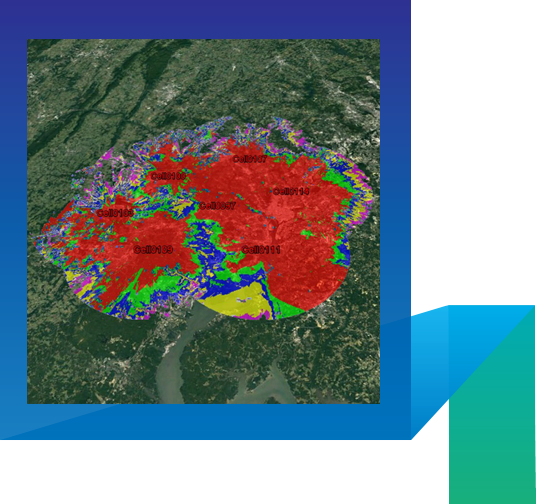 Collect field measurement data to verify coverage simulations and document areas with poor coverage. Postprocess data and perform statistical comparison with predicted coverage plots. Adjust RF propagation model parameters based on measured data to increase accuracy of network coverage and interference predictions. Update coverage and interference plots accordingly.